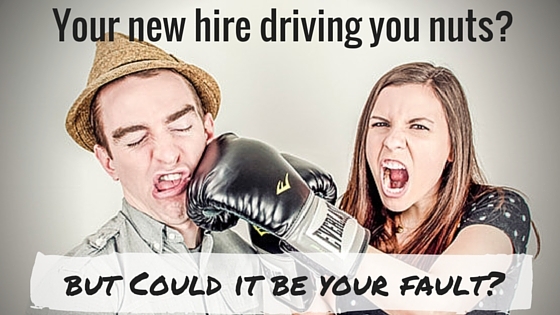 Your new hire driving you nuts? Could it be your fault? Man! You thought he was going to be good. He showed so much promise at interview – the skills, the personality and experience in your industry. You had no doubt in your mind that he was the guy for the job. Yet, a few weeks in, and your new employee seems to be floundering. You are disappointed. He really hasn’t met your expectations. Could I just throw in a thought at this point? Have you considered that this might be your fault? How about we walk through the kind of things that might be frustrating you. Maybe see if there is anything else you could do to help him succeed? Yes, I’ve seen this one. Might even have been guilty of it myself – and so might you. Starting a new job is not like becoming part of a new social group. In general, the first few times we meet people socially, we (well most of us) are on our best behaviour. We can swallow petty annoyances with people as we get to know them over polite conversation or a football match. Unless it is a particularly entertaining evening, you don’t have reason to be controversial enough to cause too much friction. In work, it is different. Decisions have to be made, tough days have to be endured, disagreements will occur. Walking into this environment without knowing some background can feel like playing a game of Buckaroo. Do you remember that one? It’s where you took turns to laden the plastic donkey’s back with a selection of bizarre utensils. You didn’t know at what time, and what utensil would provoke the donkey to buck. Was there anything you could have forewarned him about so he could’ve played the game differently? Who are the people you handle with care? Every organisation is packed full of different personalities. That’s what makes them work. It’s also what makes them hard work. You will have learnt how best to deal with Sarah in Finance and David from Marketing. You also know what can really wind them up. Give your new hire a heads up. He can find his own way from there but help him at least start with a win. What are the office politics he needs to navigate around? You are truly blessed if your company is without these. There is generally a little something bubbling away somewhere if not a full blown battle. Perhaps it is an ongoing dispute between your team and the Sales department. Or the Services team that delights in every mistake your team makes. He is new so he is already feeling vulnerable. Don’t let him make an avoidable mistake and put him either further on the back foot. These discussions don’t need to be a character assassination of your peers. Neither do they need to feel like a long list of all that is bad with the company. View it as putting down the stepping stones for your new hire just in case the alligators are awake in the river. Something is just not gelling. You can see he is still on the periphery of this team that normally works really well. And the original team are moaning about it. Is it him or the team? It is tough to be accepted by a close knit team. Perhaps he is the first new hire in a while and it is shaking up the dynamics a bit. There is no better feeling than being part of an amazing team at work. They will be nervous that a new face will ruin that team feeling. And he may well initially. You are smart. You saw that a skill or discipline was missing in your team and hired accordingly. Good move – but that may give those team dynamics a bit of a kicking too. Let’s say you have a team of ‘big picture’ and ‘just do it’ kind of people. You may have felt the need to bring in someone who would provide some systems and structure to the team. The existing team may feel he is slowing them down with his process flows and documentation. Likewise, if you have hired a ‘big picture’ person to a team of ‘just do it’ and ‘process map’ guys, they may feel overwhelmed by his focus on the future rather than the day to day priorities. It is important that they understand each other’s strengths, and how a combination of all of them will make them a stronger team. Oh and they may need to compromise too. Beat someone to the job? Did he get the job that someone applied for in the team? My feeling is that you should be transparent with the new hire about this. They can make better decisions on where to put their feet then. New role in the team? Perhaps your team are feeling unsure of what their roles are with the new team member coming in. Have you been clear and discussed what your new expectations are of everyone? Joining an existing team is a bit like meeting your in laws for the first time. There have unfamiliar rituals, baffling inside jokes and a history between them that you need to figure out. Taking time to get to know each of the individuals is critical. And knowing you don’t have to love them, you just need to get along. Are you cramming him with too much information? Does he need to know everything you are telling him right now? Think about how you are scheduling the training. What is the minimum he needs to do at least part of this job? Teach him that and let him have a go. Then teach him some more. He will forget a lot of what he doesn’t use immediately. Are you giving him time to digest all this information? Research has shown that giving new employees time each day to reflect on what they have learnt makes them more effective than using that time to learn more. Help his poor brain process all this new information. In what ways are you approaching his learning? If he has been sat with a set of headphones watching online training for the last week, it is a wonder he can even remember his own name. He will probably take in only half what he learns in this way if he does not have time to action it. Different people learn in different ways, have you asked him the best way he feels he could get up to speed? Does he have a ‘go to’ person to support him on his way? Someone probably at his level, who is patient and understands how hard it is to be new. This should be the person who answers all the dumb questions. Everyone has those stupid ‘new guy’ questions that they should not have to ask the boss they are trying to impress. Are you giving him the support that he needs? Has your onboarding given him all the pieces of the jigsaw to put together to make the sense of your business? Is the onboarding appropriate to his job level? Are you making any assumptions that they have knowledge that they just don’t. This can be particularly relevant to two job levels. – Middle Managers. This is a tough level to start in a new company. Especially if this is a promotion – it could be the first time they have managed a team. But you saw that ‘promise’ in them at interview, do you remember? They will need mentoring, just like if one of your internal team had been promoted. They not only have a new job to take on, but often a new team as well. They will have to start making decisions very early on, with very little knowledge to go on. And they have a whole team watching what they do. This group will need more help with building that all important support network. Help them with introductions of key people that will be invaluable to them. Encourage them to make decisions, keep your door open as a sounding board, and don’t knock them down when they make mistakes. Does he know how he is doing? Does he know what your expectations are? I mean really know. Are they written down so you can both review them? Without having a measure for his progress, how will he know how he is doing. Have you spoken to him about your concerns or just looked on disgruntled from the side-lines? Give him the opportunity to get things right and give him your full support to do that. Every company is different in the way they get stuff done. You need to tell him the unwritten rules for your business. What is the preferred method of communication for the company – email/skype/slack/phone? Do you tend to work collaboratively or independently? Do you tend to discuss issues or plans in a meeting? Any etiquette about who should be there? How are decisions made and who is normally involved in that process? How much autonomy does he have? Do people normally go out for lunch or have a sandwich at their desk? Are the hours flexible or does he need to be here at 9am on the dot? It is so easy to forget what tripped you up when you first started in the company. And how awkward that made you feel. Things can be especially different if you are moving from a large to small company or vice versa. Ask recent new hires what they found different about your company? Get them to start of log of these things that could be shared with new hires coming in. Make it a task of each new hire to make some additions to it. Have you done your best to help him succeed? Put yourself in his shoes. He was competent at his last job, and now he is not. Undoubtedly he feels that and there is nothing more demotivating than thinking you are failing. You saw promise at interview. Try and uncover that. Disappointing starts happen to the best people. Take footballers as an example. It is announced that a big name footballer is transferring to a new team. The new fans are euphoric. This guy is magical, the ball just seems to follow him around the pitch. Expectations are bursting out of the stadium. And then he shows up, and for some reason that magic is gone. Same guy, same skills, different environment. It can take a while for that magic to show through. Sometimes it never does. So if you really feel you have done all of the above, maybe he is not your guy. It happens. And you should never keep hold of the wrong people. But you saw something in him, didn’t you? Give it another push to try and unleash that promise. Man! You thought he was going to be good. I bet he still can be.